Greg is a phenomenal athlete! In 1996, he was struck on the side of a major Austin road, leaving his lower left leg severely crushed, and later amputated below the knee. Just a year later he compete in his first cycling road race as an ampute. In 1998 he was named to the US Disabled World Cycling Team. After training at the Olympic Training Center in Colorado Springs, Greg went on to compete at the US Paralympic Road Race Cycle Championship where he place 3rd. Greg continues to race in regional road bike competitions including the Livestrong Challenge; the grueling Copper Triangle; and Texas State Time Trial. In 2009 after reading about Texas Rowing For All in the Austin American Statesman newspaper article, Greg became fascinated with the concept of rowing as a way to boost his strength and cross train. Little did he know, that he would become hooked on rowing! 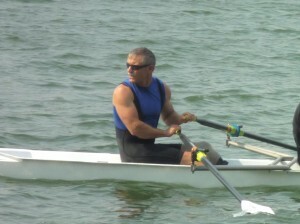 Greg began his rowing career learning to row and training with TRFA and as his rowing technique and skills quickly formed, he joined the adaptive competitive ”Air Crew” . Greg entered regional rowing regattas and always came away with a medal! In 2010 he attended the US National Rowing Team Camp in Oklahoma City. 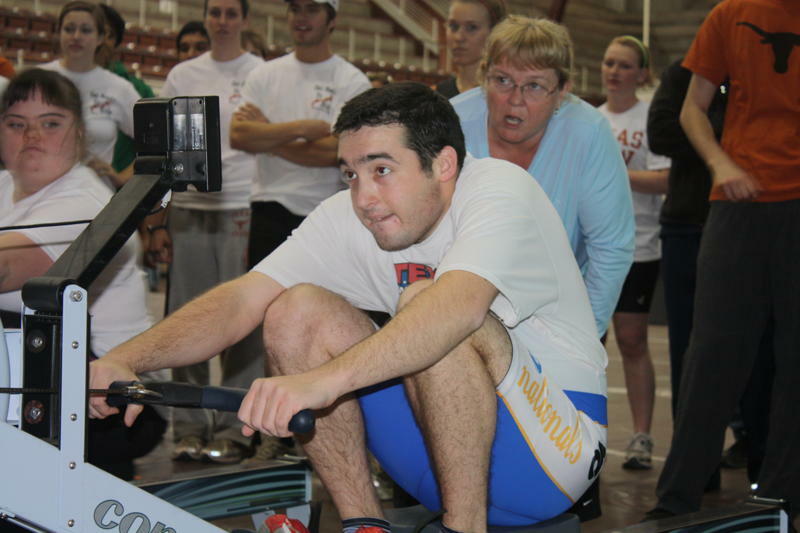 In early, 2011 Greg went on to compete at the CRASH-B’s, the World Indoor Rowing Championships where we came in 6th place in the World! Beyond his racing, training Greg is a tremedous asset as a volunteer to Texas Rowing For All organization where he serves on the TRFA Board of Directors and is one of the principals in designing the www.texasrowingforall.org website. Injured April 17, 2005 in Army training, suffered stroke and partial paralysis on right side of body and subsequent seizures in October, 2005 and February, 2006. Received military medical discharge at 100% disability rating. Through help from Jeanene Griffin, CTRS at the Veterans Administration in Tampa, Florida, Eric was introduced to adaptive sports. Eric had opportunity to attend four adaptive sports camps at Snowmass Mountain in Aspen, Colorado. The camp provided instruction in a variety of recreational sports and helped with a focus on active rehabilitation and active sport participation. Later, Eric attended another sports camp in Chula Vista, California. At this camp, Eric was introduced to John Register from US Paralympics who encouraged training back in Tampa. Eric met with John Register and other potential Paralympic athletes in Oklahoma City, the site of the 2008 Endeavor Games. At these Games, Eric competed in Track & Field and won Gold medal in the 800m and 1500m races. Additionally Eric won a silver medal in the 1000m swimming event and a bronze medal in the sprint cycle race (3.4 miles). During the time spent in Oklahoma City Eric was introduced to the sport of Paralympic Rowing by National Team Coach, Karen Lewis. Eric continued to train in running, cycling and field events and competed in 2009 in Salida, Colorado in the 15 mile cross country cycling event and a 7.1 mile time trial. He placed 1st in the time trial and 2nd in cross country cycling. Eric decided to focus on rowing. He traveled to train in Philadelphia with the National Paralympic team and the National coach. 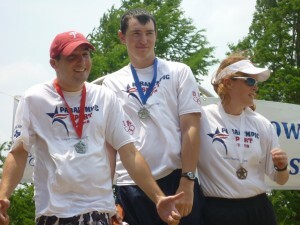 Eric was selected to compete with 3 other Paralympic rowing athletes in Ponzna, Poland at the World Championships. Although the team did not medal, this experience provided the inspiration and determination to seriously train for rowing. Eric is in the process of training with the National Rowing Team at several sites across the United States under the guidance of the National Team Coach. 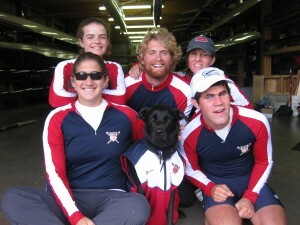 Eric and US Paralympic Rowing Team successfully competed at the 2010 World Championships in New Zealand coming in 6th in the 4+ event. Eric has trained for over a year with Texas Rowing For All in Austin. In addition, Eric participates in strength training with Sean Ahmadi at the Performance 360 gym in West Lake Hills. 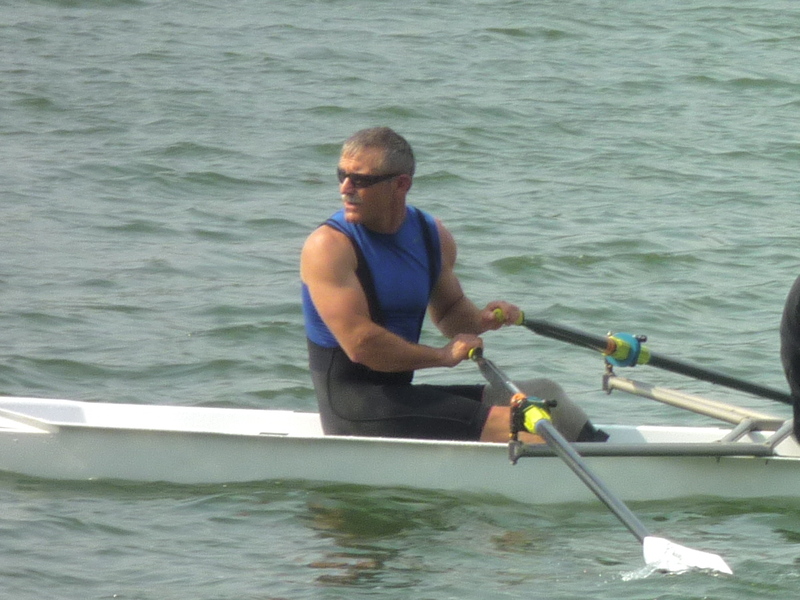 Eric’s primary rowing goal is to compete in the 2012 Summer Olympic Games, representing the United States as a Paralympic rower. 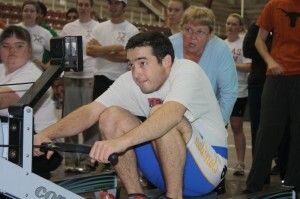 Eric has also competed twice at the CRASH-B’s World Indoor Rowing Championships, held in Boston, Mass. In 2010 and 2011, Eric won first place in the adaptive men’s category–bringing home the “hammer” and 2 Gold medals. We are very proud of his efforts and outcomes. Way to go Eric ! Calum Swinford (center) wins gold! Matthew Wright (left) silver & Hannah Brannon (right) bronze medals. Way to go! My name is Calum Swinford. I was born 1991. I’ve been rowing with the “Dangerous Athletes” since late February 2011, but I started rowing in the Fall with the TRC Rec-Crew before leaving to join the “Dangerous Athletes” crew under Coach Debbie McDiarmid. In the Dangerous Athletes I serve as Co-Captain along with Hannah Brannon. Just recently, I was picked as the top rower at the US Rowing National Development ID Rowing Camp. I’ve been attending Regattas since 1992 because my Dad, Ted Swinford is a rowing coach and has rowed for the US National Team and was an Olympian. We are a rowing family,… my Mom competes as a Masters rower and I have a sister, Kaitrin, who is also a competitive rower, and a dog, Zella who is a chicken and weird. I also Practice Judo and Aikido. I will be graduating this Spring and will attend College in the Fall. Matthew Wright was born in Oklahoma City on June 16, 1986. When he was 4 years old his family moved to Santa Fe, NM where Matthew learned to down hill ski with an adaptive ski program. He had his first experiences kayaking while in NM as well. Matthew moved to Austin in 2001 and graduated from Austin High in 2005. He attended St. Edward’s University from 2005 until 2008 as one of ten special education students in the GO Project, a collaborative program with AISD. Matthew plays basketball, bowls, cycles, plays tennis and swims in addition to rowing on the “Dangerous Athletes” Rowing team. He works for the Texas House of Representatives as a messenger in the Sergeant-at-Arms Office and volunteers at the Texas Military Forces Museum at Camp Mabry.